Bob Rhodes explores why people may be becoming less involved in community life. He suggests that we’ll only see empowered communities once people feel more supported to do things they care about in their area. By Bob Rhodes, Co-Founder and Director, LivesthroughFriends. As a Parish Councillor for Ruspidge and Soudley Parish Council, I quickly understood that even our relatively small body, often by default, is compelled to devote inordinate time and various strands of public money sustaining public assets. In our case, this is two community buildings and two playing fields, which our citizens rarely use and, seemingly, don’t value. Increasingly many citizens feel pressured, strapped for time, insecure, and/or lonely and isolated. Whether this is factually true or a consequence of the choices we make about how we use our time is debatable (on average we all work less hours than we did 40 years ago) but the simple fact remains that we are less likely to know our neighbours, and less engaged in communal activities. The consequence is a very discernible decrease of neighbourliness and informal/reciprocal ‘care’. People continue to associate and organise – and crucially take the lead – around things that really matter to them. However, they need to be exceptionally resourceful because the public institutions rarely lend their support unless people are prepared to amend their purpose to coincide with those institutions’ objectives. In the Forest of Dean, in common with many other communities, while people are to varying degrees making use of community facilities, those prepared to contribute to the governance and management of those facilities continues to fall. Why are people less engaged in community life? What contemporary community work tells us – as evidenced in the recent Participatory City research into initiatives in London, by similar projects around the UK, and indeed in the plethora of statutory and voluntary community development initiatives that flourished between 1945 and the early 1990s – is that it’s not that people don’t want to participate regularly, enjoy reciprocal neighbourliness, feel safer, live more sustainably, or benefit from enhanced social capital; because they definitely do! And it is not because people don’t have lots of exciting ideas about things they would like to take part in. It seems that, for many reasons, people feel less confident and competent than was the case in the past to assume a leadership and coordinating role. However, masses of evidence and coal-face experience tells us that when there is professional assistance available in the community to help citizens translate their passions into actions, things get done. Presently, in response to the impact of austerity and public services cuts, community work is back on the agenda. Unfortunately, it is likely to stutter given our public institutions unfailing incapacity to understand that it is not a great idea to set out to co-opt citizens to deliver the government’s programme. Effective community development takes place where people are supported to do things that they care about. It is the spin-offs from the community cohesion and reciprocity that results that, while difficult to measure, can have the greatest impact on lives. And so, our Parish Council has resolved to employ a community worker – initially for 20 hours a week for an exploratory year. 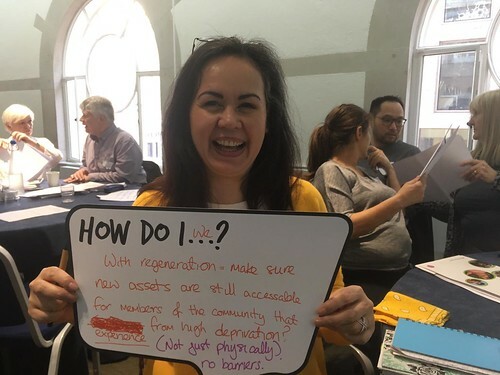 The worker will, among other things, act as a catalyst for linking up local connectors and projects, promote community use of our facilities and help people associate and participate around activities that matter to them. We will see how it goes, but my hunch is that this kind of ‘slow burn’ community work remains crucial in creating a more empowered future.